Yes, give me my discount right now! Just want to send traffic to a single lander and then an offer? This couldn’t be simpler. I wholeheartedly agree with the claim that FunnelFlux is the "Best Funnel Tracker in the Universe!" I have been an online entrepreneur for almost 20 years and have never witnessed a more powerful and sophisticated software that delivers your data with pinpoint accuracy along each and every node of your sales funnel. 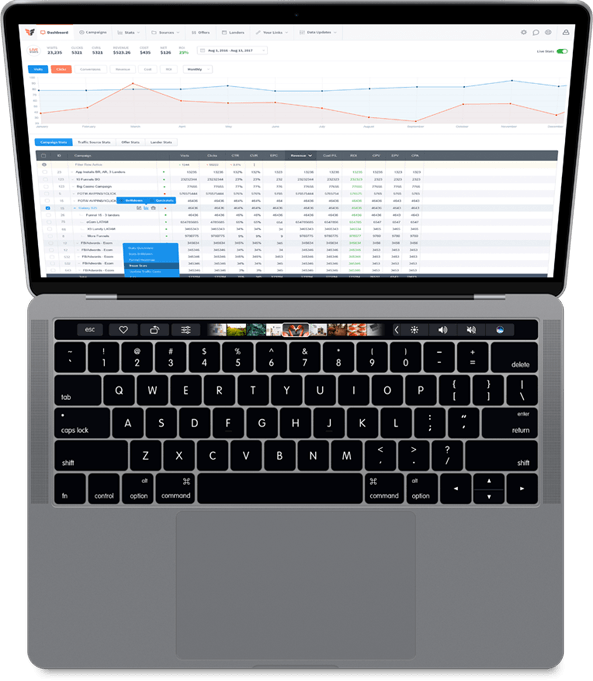 FunnelFlux is a "Next Generation Must-Have Software" for performance marketers who want complete control over their advertising budget. From the visual interface to the traffic & conversion heat maps, vital information is literally at your fingertips. My team and I are so impressed with FunnelFlux that we have decided to migrate or should I say "Flux" all of our existing campaigns! I can now test, analyze and optimize a variety of campaign types in no time. Also building them, with the help of the visual builder is a dream come true. And did i mention the gorgeous support they are offering? FunnelFlux is about making you money. Serious money. Worth every single penny, without any doubt. If you have struggled with other tracking products where you need a degree just to install it, then FunnelFlux will be a revelation to you. Its simplicity is just a part of its power, because hiding under its sleek and slick interface is an engine that could power a journey to Mars and back. With features you have only ever dreamed about up until now. Within milliseconds of sending traffic through my funnel, I was able to determine where that person lives, where they ended up in my funnel, what device they were using, how long they spent in my funnel. Even the size of the display they were using and that was just a mere scratch on the surface of what FunnelFlux delivers! For me, it's crucial to maintain a profitable marketing & sales funnel for my clients and myself. Over the years I have used various testing, tracking, and variant software and sites, to identify what is converting and what is not. Of course they had their pros, but they never really gave me the ability to drill down to a granular level to find out intricate details of the visitor, nor did they give me the ability to create a sales tracking funnel to this sort of degree and flexibility, and that is only the tip of the iceberg with this groundbreaking software. Take it from my 20 years of online experience, if you're remotely serious about marketing online, you'll want this set of tools in your arsenal before you launch any campaign. Not only that, I have worked with Vita on various other projects for close to 5 years and he is certainly someone I know will ALWAYS over-deliver on his promises -- this software is no exception. Instantly I noticed that FunnelFlux was very easy to install and initialize traffic sources, affiliate networks, and offers for your campaigns. Setting up sub IDs is so easy, it's night and day compared to the competition. Absolutely no hassle. The stats are very straightforward and you can see instantly what is, and is not working with the new heat map feature. It's really cool! I think you're really going to love the visual construction of your campaign funnels, because you can easily construct landing pages, rotators, e-mail campaigns, and anything complex you can think of extremely fast with a click of a button. Using FunnelFlux is a joy. Overall I think you're going to love FunnelFlux's ease of use and fast, "know what's going on with your campaigns" operation. There's an old saying, "What gets measured gets managed." FunnelFlux takes that saying and puts it on steroids. I can't believe how much faster I'm able to build my sales funnels using FunnelFlux. I love that it's self-hosted (I'd NEVER trust a company to host my tracking solution), runs incredibly fast no matter how many clicks you throw at it, and runs great on a cheap VPS. Did I mention it has easy, visual split-testing capability BUILT-IN? FunnelFlux is so simple to use I think even complete noobs could quickly become very profitable with it. Thanks, FunnelFlux... You've raised the funnel tracking bar very high indeed. How does your tracker compare? You want features? Here you go! * For as long as your subscription is active. FunnelFlux Managed offerings are individual infrastructure stacks deployed privately for every customer. We handle the technical back-end, you focus on marketing. * This is our suggested monthly volume cap. The system will tolerate greater than this in short bursts. I don't understand what your software does exactly? Imagine you have a squeeze page and then promote affiliate products on the backend. You are sending traffic to this squeeze page through multiple channels, like Bing Ads, Facebook Ads, Solo Ads etc. At the end of the day, what you want to know is where your ad spend is best allocated. FunnelFlux allows you to do just that; you can see how much money you s pent on each of those traffic sources, how much revenue has been generated by the leads from those traffic sources, independently. You can analyze with great details to find things like women from 25 to 34 convert very well from a very specific facebook ad, while women above 35 barely convert. You can go further and see that women from 25 to 34 from France using an Android device give you a profit while women from 25 to 34 using an iPhone or a desktop computer cost you too much money. With this data you can then change your ad targeting to only pay for the converting traffic and stop wasting money on the non-converting one. This is what we call campaign optimization and FunnelFlux is the best software for that. You can't really compare FunnelFlux and ClickFunnels as they're not used for the same thing - but they can be used together. Clickfunnels is basically a page builder. You create pages thanks to templates and define the order in which you want them to appear. They have very basic tracking in place, which is unlikely to be enough for a media buyer or affiliate to optimise a campaign properly. FunnelFlux on the other hand doesn't have any page building capability, so you need another software to create your landers, but is the Rolls-Royce of tracking and traffic routing. Yep! We offer a $1 trial for a full 30 days. After that, if you're rebilled and you are still not happy with FunnelFlux, just cancel your subscription within 3 days and we'll fully refund you. Yes and no. If you want it to be. FunnelFlux offers a self-hosted option that you must install on your own server. We have a deployment mananger that helps you deploy FunnelFlux easily, and have documentation/automations to help with doing so on basic VPS servers. We offer free installation to all customers on several providers (Vultr, Linode, etc.). We also have a Managed Version of FunnelFlux, which is our primary product - here we manage the infrastructure for you and can provide a higher performance product overall. We monitor the uptime and update the software for you. If you mean tracker redirect speeds, we’re satisfied that you won’t find faster. It’s quick. Overall speed of course depends on where a tracked user is compared to the physical server you are running FunnelFlux on. FunnelFlux is also intelligently built to use multiple caching layers, such that redirects don't access your (relatively) slow back-end database, and logged data also gets cached before making its way to storage. This makes FunnelFlux extremely capable at the software-level of dealing with bursts of traffic and extreme loads. Yes. Both in our relationship with you, and in the way our software works. We made significant changes to our software to anonymise data giving compliance by default, and have created advanced cookie-less tracking with our on-page JS, which you don't need to ask for consent for -- so you can track without being compromised by users refusing cookies. You can learn more here. I'm not a techie, is it difficult to install? If you use the managed version, you don't have to do this at all. If you use the self-hosted, it takes just 5 minutes to install using our deployment manager. Doing it more directly is also easy: create a database, copy three files, open your browser at your files location and follow the simple instructions! It's that easy. And in case this is still too complex for you, we're close by and can help you get set up for no charge. I hate it when I need to update my self-hosted applications. Can you update my installation for me? FunnelFlux auto-updates by itself. You don't need to do anything to get the latest version other than clicking an install button to approve the installation. On the managed version we update the software, you don't have to and can't (we do this to ensure stability). What are the minimum requirements to install Funnel Flux? Do you recommend a specific hosting company? If you're not afraid of managing your own server without cPanel, we recommend Vultr - they have the fastest servers at the lowest prices. Otherwise, Linode and DigitalOcean are good choices. Of course. Quite an open one at that. We also have a savvy, active development team - so if you have an API endpoint of functionality you desperately need, let us know. Can you help me migrate from another tracker? How many copies can we run at once with one license? One license allows you to install one single instance of FunnelFlux. However, your pages and offers can be on any server or domain. Your installation acts as a hub for all your marketing and your statistics are accessible from one single dashboard, making it easier and faster to control all your campaigns. While we strongly recommend to use only one installation, power users can get additional licenses at a 50% discount. Of course. We offer a $1 trial so you can test to your heart’s content. For the managed version, unfortunately we do not offer a trial period.